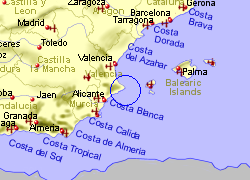 Lying around 275m above sea level and 8Km inland from the Costa Blanca resorts of Moraira and Calpe, the small town of Benissa, suits those that want to be near, but not on, this popular coastline. 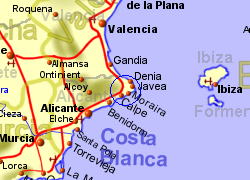 Reportedly one of the oldest towns on the Costa Blanca, Benissa has an attractive old sector with narrow cobbled streets, which has been preserved, and there are a number of notable biuldings, including the 15th century former guild hall and the 18th century Town hall. There is a large and impressive church, the Puríssima Xiqueta Church, built in a Neo-gothic style in the early 1900's. You will also find a small selection of shops and bars and there is a traditional market on Saturday mornings. 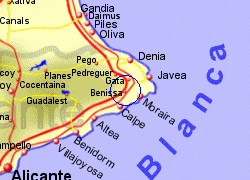 Map of the Benissa area.